Along with providing exercise, riding to work offers a good opportunity for reflection. Recently, on a call with my Frontier Group colleagues, I shared that I wanted to write a blog about why I love bike commuting. To my delighted surprise, others jumped in and said, “we all should!” It was then that I realized for the first time that all of my co-workers primarily bike, walk or run to work. The stories of how my co-workers came to be active commuters illustrate the challenges and obstacles in expanding access to this habit. Some of us had bad experiences on bikes or lived in places where biking or walking to work was not feasible. Others of us, however, learned sustainable commuting habits from our parents or saw other kids biking around town while growing up. There are a couple of things we all have in common: we all live reasonably close to work and we live in places with at least some infrastructure for biking and walking. Most of us also share similar reasons for adopting this habit — it saves time and money, provides an opportunity to exercise in the outdoors, helps keep us connected to our communities, and provides an important time to clear our heads between work and home. Read on for our personal stories of commuting using our own motors. Maybe you’ll find inspiration to give it a try yourself or gain ideas to help make your community more welcoming to pedestrian commuters. Growing up in Kansas, biking was one of the more dangerous things a person could do. I once overheard my college professor exclaim out loud when a student said her calf-length scar was from getting hit by a car while biking. The professor rolled up his sleeve to reveal an arm-length scar. “Me too!” he said. I was scared of the idea of biking to get places for a long time. When I first moved to Denver, I took the bus. When I moved to Southern California, I drove, not being able to afford rent near my work. When I moved back to Denver, I lived with a roommate with whom I split a Lyft to downtown every morning — sharing with him was the same price as the bus, and took way less time. This roommate was also a true believer in witty banter first thing in the morning. I did not realize how sacred the quiet of a morning commute could be until I commuted with him. A month later, I bought my first bike on Craigslist, and named it after the only war horse in American history to be promoted to rank of sergeant: Sgt. Reckless. It’s a Trek, at least 15 years old, according to the nice bike shop man who first pointed out to me that the seams on both of my tires were shredded, and that I’d been riding with the latch to remove the tire very open. He would later teach me how to unstick a stuck seat, the difference between a Presta and Schrader valve, and how to fix a flat tire all on my own. I have been a bike commuter for six months now, and I’m not afraid anymore. Bike lanes are a godsend, but even riding without them is not the constant scene out of Grand Theft Auto I had imagined. The people of the bike community are welcoming and happy you’re here. And not only is my morning commute back to the quiet, meditative practice I like, but it’s mine in a way it’s never been before. 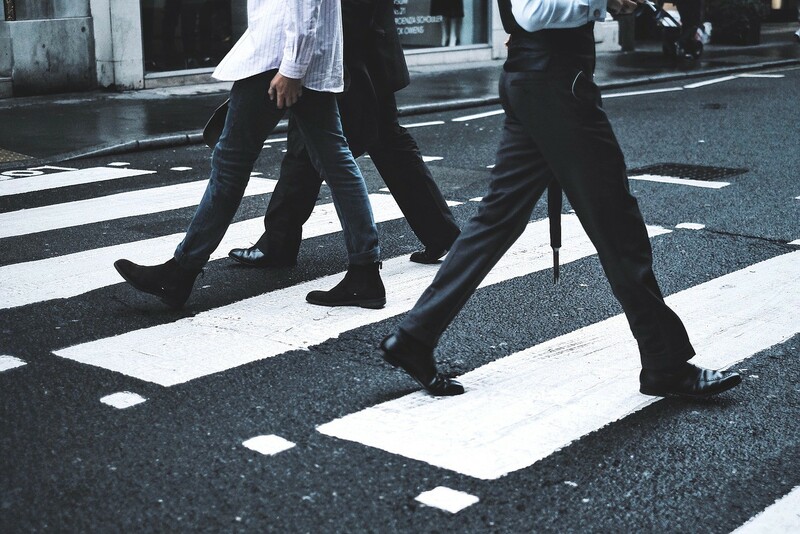 While most people recognize walking’s health benefits, it is also a great opportunity for community building. In 1997, I moved into my current home, one mile from our Santa Barbara office. I bike commuted until 2001, then started walking. I count on my walks. In the morning, walking eases the transition between getting kids out to school and getting to my desk. Ideas grow out of that time. At the end of the day I head out, lately into the winter dark, with a rechargeable red safety light on my backpack, walking fast, reflecting on the day and moving my brain toward home. I’ve become a neighborhood watcher. That means being a frequent caller to gas leak hotlines as well as services that pick up abandoned shopping carts and oversized trash (e.g., mattresses). I notice the real estate market turning when for-sale signs disappear or proliferate. I know the places where sidewalks should be but aren’t. I don’t mind that the streets are dark, because we can see the stars pretty well from here. But I have tripped and fallen on uneven ground. I have greeted the elderly women who picked up litter around their block in the mornings and missed them when they ceased their labors a few years ago. I have watched trees grow. On foot, I see my community, and I am grateful. Commuting to work is my favorite part of the day. I get there by biking on a path along a bay — under trees and by ducks and swaying reeds, often lit by glowing, early-morning sunlight. I grew up on a road where cars drove fast and there was no shoulder. It was out in the boonies far from school so biking was not an option. In college, my friends and I mountain biked. We’d pedal around town and campus, jumping off various things, which was fun. The alternative was fighting for — and paying for — parking and then walking to class, which was not fun. So, I either biked, walked or took the bus. After college, I was back in rural parts of Maine and New Hampshire, far from my job and shackled once again to a car. The next time I started bike commuting was when I moved to Boston to work for Frontier Group. I initially took the train every day but decided that I’d rather not pay for a monthly pass. So after my first month, I tried out bike commuting again and fell in love. I would frequently — and honestly — say it was my favorite part of living in Boston. I was blessed to live near a path along the river and away from cars that led most of the way to our office. I love bike commuting because it makes me calm. It’s when I clear my head, and how I get my daily dose of nature during the week. It makes it so I don’t have to stress about when to work exercise into my day — it’s just there and takes up no extra time because I’d be commuting anyway. The consistency of biking twice a day has made me more fit and healthy than less frequent, more strenuous workouts previously had. And best of all, I’m getting by without a car, which is saving me money and countless headaches. Growing up in outdoorsy Boulder, riding your bike to school was a badge of honor — a sign that you had entered the “big kid” ranks. It was the one time of day when you were free of nagging parents and watchful teachers. It was a time to show the world you were your own independent person — and, as a true Boulderite — a time to meet your daily outdoor adventure quota. Up until middle school, I lived 10 miles from school up a steep and twisting road, so I stayed behind as, one by one, my friends ditched their parents and pedaled their way to independence. In sixth grade, we moved a couple of miles away from my school, and I was finally able to scout my own route and join the cool kids at the bike racks. Today, not much has changed. Being within biking distance of work was one of my top criteria for choosing an apartment. I haven’t lost the simple joy of feeling the fresh air and being alone with my thoughts — plus I get the satisfaction of zipping by cars stuck in traffic. If anything, that time is even more precious now that I live in a big city and have a full-time job. Every day, when I pull up alongside the other cyclists outside my office, I’m still reminded of being back at my middle school bike racks and I know my childhood self would be proud. 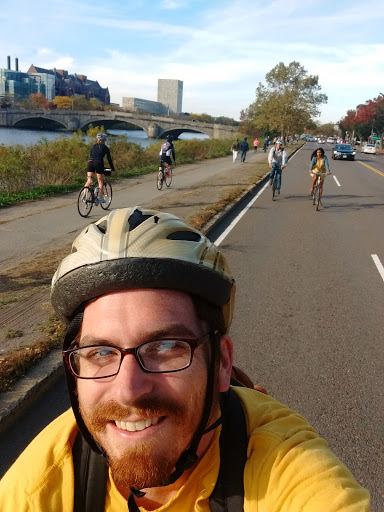 Frontier Group policy analyst Gideon Weissman on his bike in Boston. I’ve been getting around by bike since my very first days of commuting through my hometown of Cambridge, Massachusetts. Back then, my dad would load me and my brother into a plywood trailer and tow us to preschool. It was a few more years until I was getting around by bike on my own, but after many dad-lessons on how to avoid getting doored or run over, I was biking to high school. By then, I was pedaling everywhere, including to late night parties in order to avoid getting into cars with drunk drivers. These days, my bike commute is something that brings me a lot of joy. It gives me a bit of exercise and fresh air each morning. The excitement of dodging heavy traffic on my route to Boston is something I could live without — but it is definitely a foolproof way of waking up in the morning. And I take some pride in being a year-round biker, braving the cold and the slush each winter. 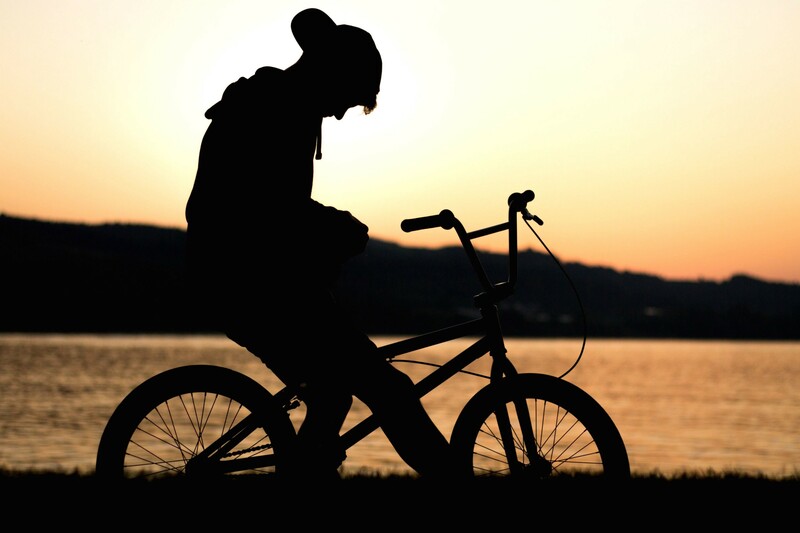 Biking is a big piece of my life, and something I hope I never have to give up. This is the first in a two-part series. Read the next installment here.